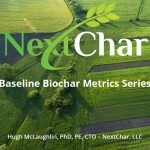 The goal of these analytical procedures is to provide a standardized set of simple, affordable and accessible tests, which will generate metrics that characterize a given biochar and will facilitate the comparison of biochars. The suite of tests and the associated biochar metrics are intended for testing raw unmodified biochar, if such material is available. The metrics are also targeted at biochars that are being commercially transacted (bought and sold). In all cases, the biomass raw material, pyrolysis method, and any exceptional properties of the finished biochar, relative to other commercially available materials, should be clearly identified.